I am finishing up third grade for the second time right now. The two children that have completed third grade are very different people. Our first child was reading and writing in three languages at this point. Very, very language oriented. Our other child had definite talents in movement, science and the natural world, and music. All children are individuals, and although there is a “curriculum” in Waldorf education, such as laid out in the schools and on the chart published by AWNSA, the main thing we are prescribed to do as teachers is to OBSERVE the child, UNDERSTAND child development, be interested in the world around us (keep learning) , to not go stale (in other words, what worked before may not work again!). The template of the school and the secondary pedagogical literature of Waldorf education has been helpful to me personally, but I also have read an awful lot of Steiner’s lectures and work. I steer a lot by my strong philosophical orientation of Christianity, attachment and Waldorf. I have gotten some private emails lately regarding the nine-year-change and puberty, so I wanted to write something for this space for other parents searching for support and information during this time. In the view of Waldorf Education, the soul is coming down into the body. However, I think the outward manifestation of puberty (odors, even breasts budding or getting hair in private areas) doesn’t change the course of the curriculum, nor really the developmental level that you are parenting in. A nine-year old is still a nine-year old, whether she has started her menstrual cycle or not. Puberty is an outward manifestation of the body, but the nine-year change is more an inner crisis of the soul and of middle childhood. We started our third grade year with a little block of form drawing and handwriting, which I wrote about here: https://theparentingpassageway.com/2013/09/06/beginning-of-third-grade/ and that morphed into a full-fledged Native American block focusing on how the First Peoples lived and continue to live traditionally on the land. I based this block around the Christopherus Homeschool Resource’s notion of the “People of the Plains”, “People of the Desert”, “People of the Land and the Mist”, etc as I really wanted to tie the different Native American tribes into their shelters and daily life as influenced by the land. This is a major theme for third grade work on a developmental level for the nine-year-old. We made many projects, including a leather pouch with fringe, a talking stick with feathers, small miniature tipis and canoes for our four year old’s play, a diaroma of a People of the Woodland scene, a model of a chickee for the People of the Swamps, a clay totem pole for People of the Land of the Rain and Mist, and a large clay adobe dwelling based upon instructions in “Learning About the World Through Modeling” by Arthur Auer. We also sang many songs, played songs on our Choroi flutes, played Inuit games for People of the Land of Snow and Ice, painted watercolors for People of the RIce, People of the Plains, People of the Land of Snow and Ice, and People of the Desert. We also went to a Native American Pow Wow in our state. This is also a great block for shelter building, gardening, cooking, natural plant dyeing and weaving. We are still planning to build a large loom and tie it into some reading about the People of the Desert and their sheep even after this block ends…It was a lot to fit into one block, but we had a really good time! We are also fortunate in our state to have a preserved Mound Dweller site that we visit at least once a year and will be doing that after this block ends as well. I painted a narrative of the land for each region and each region’s tribes, and also told stories from different tribes from each region. I used the stories to review vowel sounds, word families, consonant and vowel blends for my third grader. This is easy to do from the stories because these consonant and vowel blends are everywhere in written word This can lead to word families such as a wigwam word village, a village of igloos, etc all with word families written on them. My third grader created and wrote summaries with a focus on these word families and phonics blends, and worked with spelling words each week from the stories of different tribes. Our third grader has heard quite a few read -alouds during this almost two months of homeschooling this year, and I wanted to share a few of our favorite titles with you. The Third Grade curriculum focuses largely on how humanity lives on earth, being here on earth and our connection to the divine and authority and the journey we make as human beings. It is a beginning foray into a protagonist a child can identify with, as opposed to solely archetypal characters, but I would urge you to hold off on literature with darker and more mature themes. This is a bridge year with literature for children who nine or almost nine. Waldorf parenting and education, I feel at its core, is often about keeping children as “young” as possible as long as possible. A good rule of thumb is to help your child choose literature where the protagonist is about the same age as your child, and if you have a sensitive child, to always pre-read. This time of year for me is not only for planning on paper for our fall homeschooling, but also time for de-cluttering, re-arranging the school room, and crafting some beautiful things to inspire us through the grades. This fall, I will be teaching third and sixth grade with a cute little three year old in tow. I wanted to make something to hang on the wall that represented Third Grade for our schoolroom and the picture of Moses and the burning bush was foremost in my mind. There are images of this scene on the Internet and in iconography and I looked at many images before I decided upon an idea to use to paint with wool. 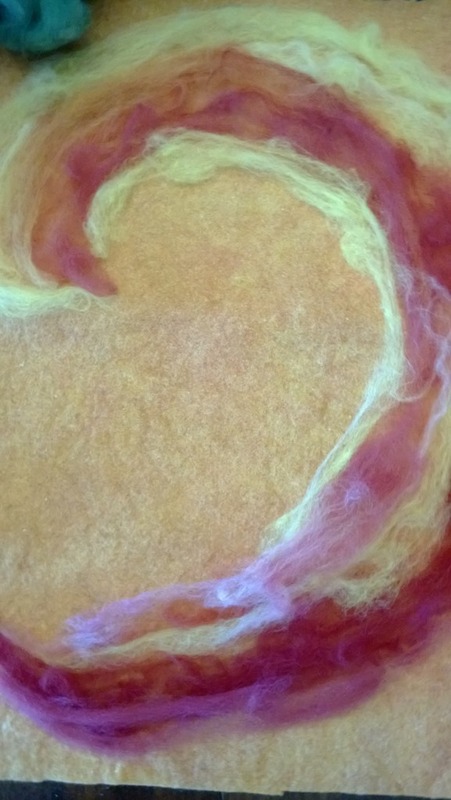 Making wool pictures is an easy project – all you need is plant-dyed wool felt for your background, plant-dyed wool roving, an iron and ironing board, and your imagination. I order my plant dyed materials here: http://www.etsy.com/shop/mamajudes# I don’t believe synthetically dyed materials will work for this project. Start with a background felt of your color choice. Take the wool roving and tease it apart with your fingers. Start to layer it in very thin layers into the shape that you want by taking small amounts of the fiber, holding one end in place and stretching the fiber apart. Pat everything down. I suggest ironing the background with long periods of holding the iron and then layering in more fibers and the details that are more in the foreground. 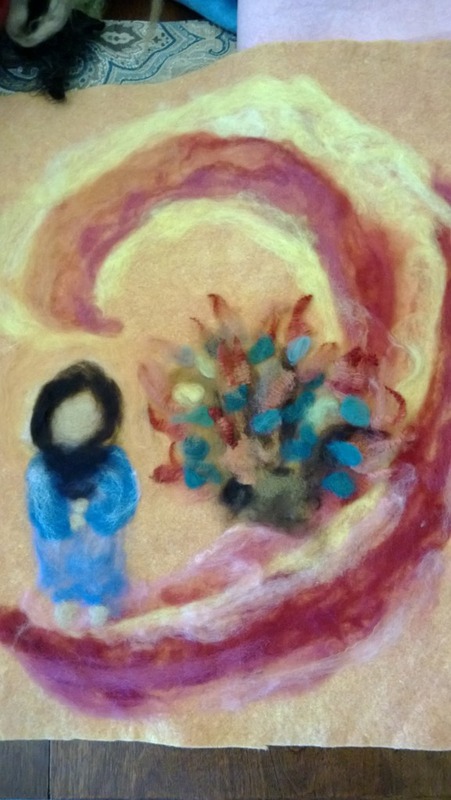 The wool roving will then stick to the wool felt and you will have a beautiful, dreamy picture. I pressed this with the iron, and then added in the bush with its green leaves. Then I layered in special red wool roving into fire on the tips of the leaves and pressed that. The figure of Moses came last. These pictures are easy to do and so full of possibilities! One of my best friends wrote these words, and was gracious enough to let me share these words with the world. I can see this being printed out and put on refrigerators everywhere for a dose of encouragement. I remember back to when we were homeschooling, on those really hard days when the house was a mess, and I was a mess, and the kids were a mess, and I would be having the passing thought that I should send them to school. School would be better for them than this. We had to do public school this year. We might have to again. You might have to one day. It’s not the end of the world, but now I see the public school experience not from my own experience, but from the experience of my children. I feel like I am really blessed with the knowledge of ‘both sides of the coin’ here. We are planning to go back to homeschooling this coming fall, so I have written a Homeschooling Manifesto. I didn’t write my little manifesto to discuss the negatives of school, but to reconnect myself with the essence of homeschool. I’d love for you to read it, file it away, and on those crazy days, you can pull it out and remind yourself of what you are really doing. I promise you, I will be reading it next year, many times. 😉 I hope you enjoy it! Today, in New England, it was a beautiful day. Sunny, breezy, low 60’s. Perhaps to my Florida family, this is a chilly day, made for long sleeves and snuggles. But to my northeastern friends, this was a day for opening windows, climbing trees, and running through the grass barefooted. As I gratefully cracked open my own window over the kitchen sink this afternoon and felt the cool breeze on my face, I realized that these three aforementioned activities are so very symbolic of the choice our family has returned to- homeschooling.